South Island New Zealand is a place where there are more sheep than people, where every inch of the landscape will leave your jaw agape, and where there is no shortage of incredible and unique outdoor adventures to pursue. So pack your suitcase, hop a flight, and explore the epic mountains, lakes, glaciers and seaside vistas of New Zealand’s South Island. 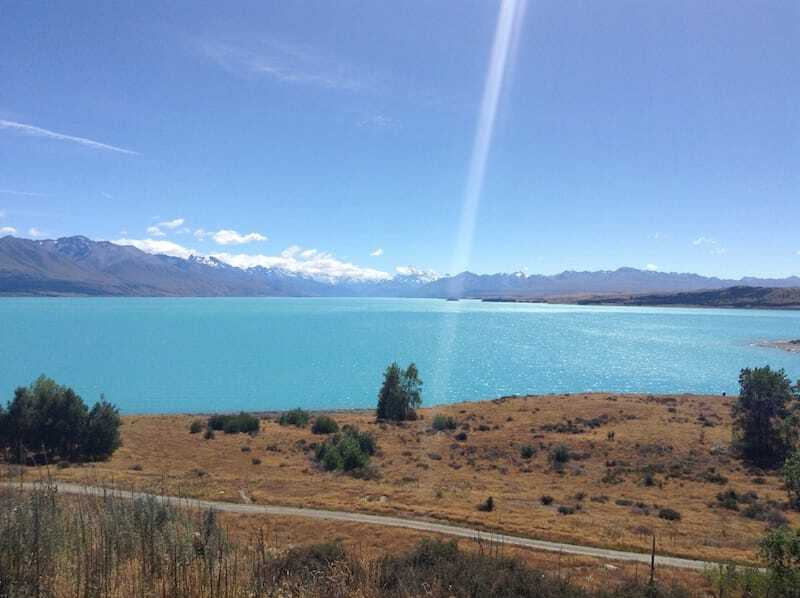 Lake Pukaki sits at the base of Mount Cook, offering one of the best viewpoints of the giant peak. The alpine lake is over 9 miles long and boasts crystal clear water – some of the purest I’ve ever seen. 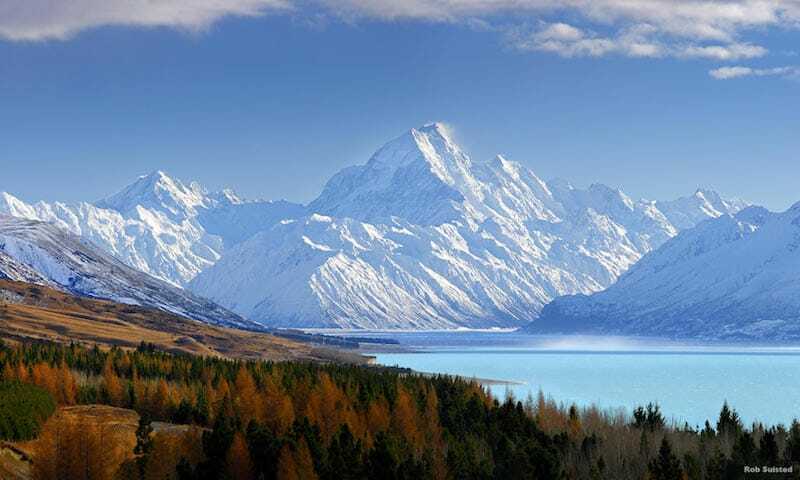 Lake Pukaki will either make you want to up your travel photography skills or ditch the camera altogether and just take it in with your own eyes since its beauty is difficult to capture. When I visited Lake Pukaki, I was in the middle of a multi-day bikepacking trip, so I took advantage of the inviting bright blue water for a refreshing swim. It was an unforgettable part of my journey! At just over 12,200 feet, Mount Cook is the highest peak in New Zealand. Its summit reigns above the rest of the Southern Alps, making it impossible to miss unless it’s immersed in cloud cover. Quickly changing weather can lead to harsh conditions, so be sure to prepare and plan accordingly when you visit Mount Cook. The small town of Motueka was one my favorite places I visited during my year and a half in New Zealand. One thing that made it so great is the Arcadia Cafe, which serves up tired backpacker-sized portions of delicious Hare Krishna-style Indian food for as little as $5 a plate. Sit outside while you eat your food and watch the small-town life go by. 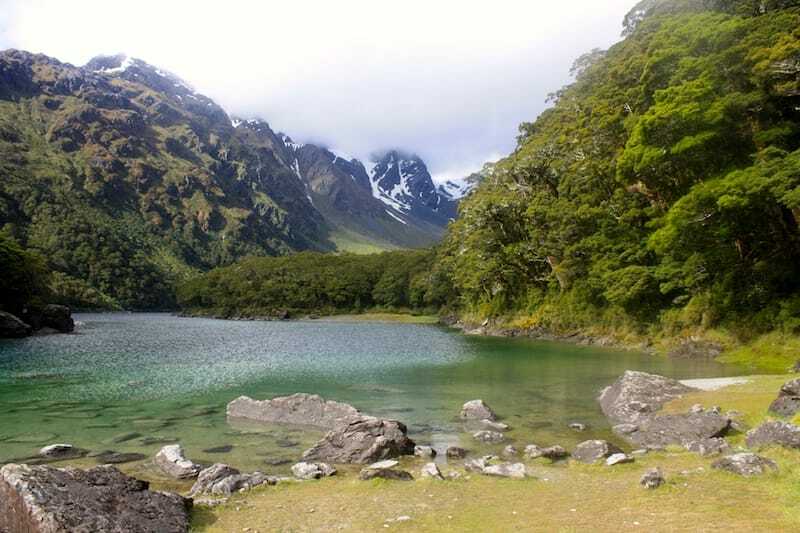 Backpacking and hiking (or trekking, as Kiwis call it) are extremely accessible activities in New Zealand. 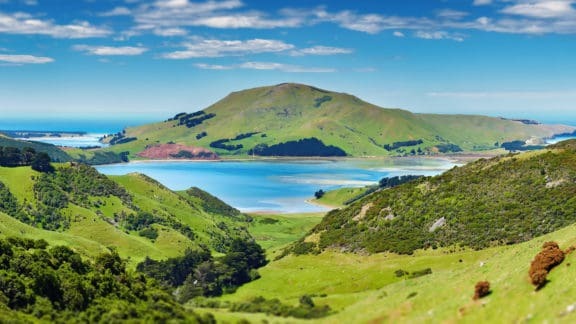 New Zealand has Nine Great Walks (seven of which are on the South Island) which follow some of the most awe-inspiring routes in the country. I did the Abel Tasman Coast Track (37 miles) and the Routeburn Track (20 miles) while I was in New Zealand. Even though it’s significantly longer, the Abel Tasman Track in Abel Tasman National Park is definitely gentler and more beginner-friendly than the Routeburn, but both were stunning and well worth the miles. Camping or staying in the huts along the way, the views are unbeatable and all the more satisfying because you had to work hard to get to them. Queenstown, adrenaline capital of the world and birthplace of bungee jumping, is definitely the place to go if you’re looking for blood-pumping thrills. In addition to bungee jumping, you can try skydiving, heli-skiing, paragliding, and more in Queenstown. 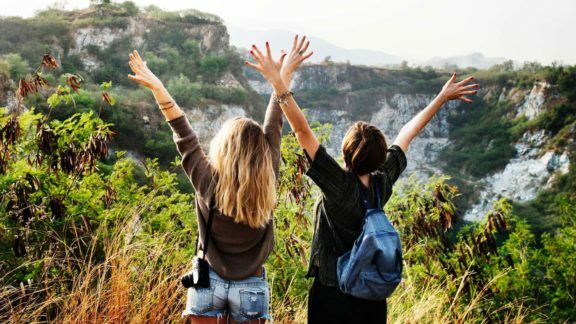 All of these activities make Queenstown a very popular tourist destination, so it’s sensible to book your accommodation in advance, especially if you’re heading there during ski season or during the height of summer. 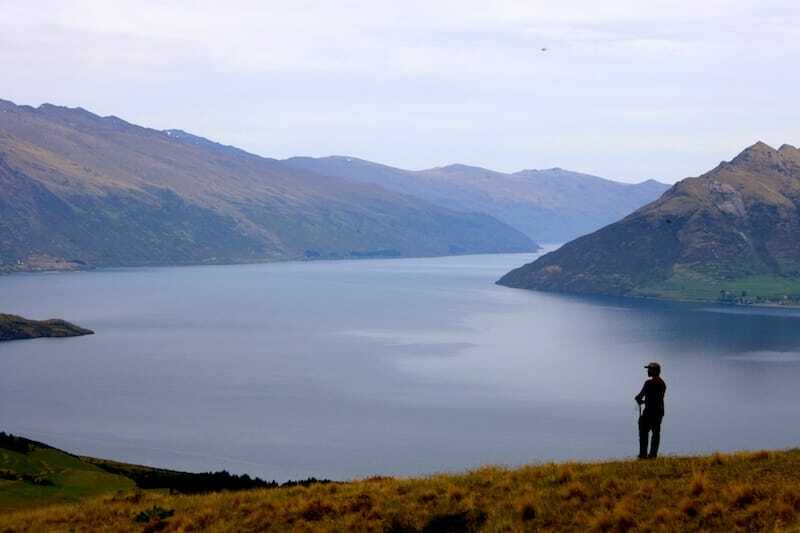 With so many things to do in Queenstown and amazing scenery, this is a must visit South Island location. Kaikoura is a really lovely little town that attracts loads of visitors wanting to see wild dolphins and whales. A common bucket list item is to swim with wild dolphins and it’s truly an amazing experience. Dolphin Encounter in Kaikoura make sure that any encounters are on the dolphins terms, making this a much better option than swimming with captive dolphins (don’t do that!). Kaikoura is located a 2 and a half hour drive north of Christchurch. Before heading to Kaikoura check with NZTA to ensure the roads are open. 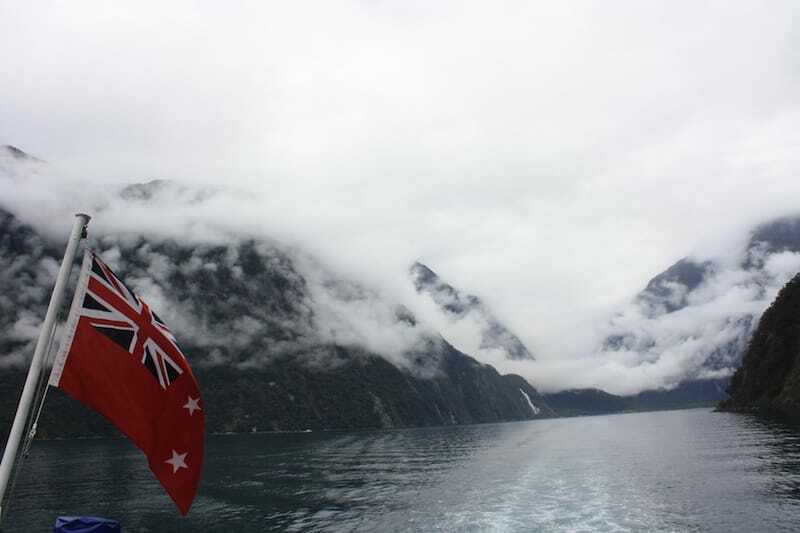 It’s easy to see why Rudyard Kipling called Milford Sound the eighth Wonder of the World. Milford Sound is the crown jewel of Fiordland National Park and is also one of the wettest places on Earth (it received 364 inches of rain in 2016)! Take a short cruise out into Milford Sound, and if you’re lucky enough to be there on a rain-free day, prepare to be amazed. Even when it is rainy, though, Milford Sound has an incredibly calm presence, perhaps because it’s so enormously astounding in beauty. If you’re even luckier, a run-in with an infamous Kea will make your journey all the more memorable. If you’re looking for ways to maintain wellness while traveling, look no further than cycling the Alps 2 Ocean Trail. The trail runs over 185 miles from Mount Cook to Oamaru and usually takes between four to six days to ride. The ride is broken up into nine segments, so you could also pick and choose what parts you want to ride. Along the ride, you’re gifted views of incredible lakes and mountains, small towns, wide, open valleys, and everything in between. Christchurch is home to the International Antarctic Centre and the city is one of five gateway cities to Antarctica in the world. The Antarctic Centre offers lots of cool interactive exhibits, tours, simulations, and educational programs for all ages. Since the Centre is located right next to the Christchurch airport, grab a cuppa from the cafe and walk around before your flight! After being hit by a devastating magnitude 6.3 earthquake in 2011, the city of Christchurch has literally rebuilt itself from the ground up. Remnants of the pre-quake city exist, but much of the infrastructure has been updated and rebuilt in the years since the quake. One prominent and unique aspect of the city’s rebuild was the Re:Start mall, entirely made of shipping containers. The mall has since closed, but it lasted nearly six years and served as an icon of the new city and what it had gone through. 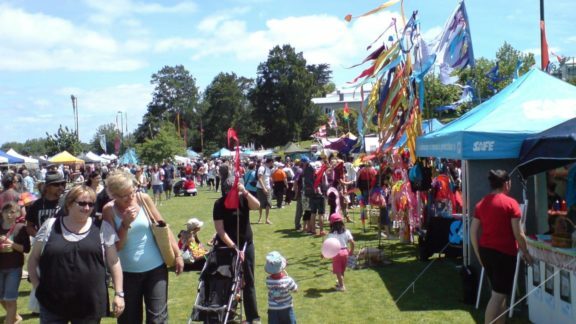 There’s a ton of culture and city life to be experienced in Christchurch — quake or no quake. 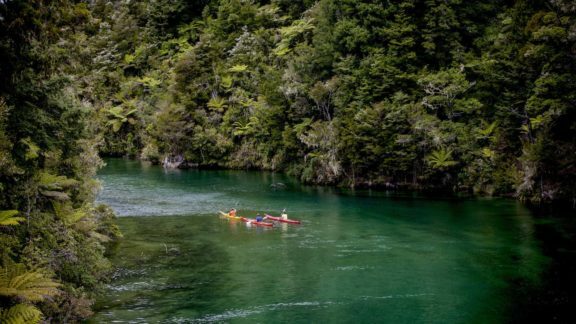 It’s easy to see that you certainly won’t run out of things to do in New Zealand’s South Island. Whether you want an unforgettable outdoor adventure, a cultural experience, or to simply sit at an outdoor cafe and watch the people go by, you’ll find what you’re looking for on the South Island. Author: Lettie Stratton is a writer and urban farmer in Boise, ID. A Vermont native, she is a lover of travel, tea, bicycles, plants, cooperative board games, and the outdoors. She’s still waiting for a letter from Hogwarts.